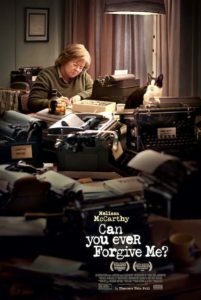 Based on the true story of New York’s best-selling author Lee Israel, Melissa McCarthy tackles a dramatic role giving one of the best performances of her career. 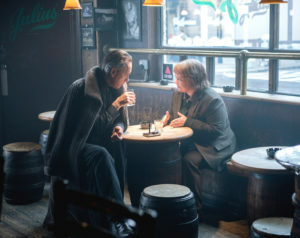 Known for her slapstick comedy, McCarthy goes deep inside the psyche of the ‘down on her luck’ author to create empathy for a character that’s near the end of her rope. You see, Israel made her living writing celebrity biographies in the 70s and 80s, and by the 90s couldn’t get published. This in part was due to her gruff personality; she preferred cats to people and regarding her writing not following the publishing regime. With a sick cat, months behind in rent, she spun her writing talents into a sham by forging celebrity letters and in turn selling them to whoever would open their wallet. Israel’s cohort in crime is a flamboyant homeless guy named Jack, who is played amazingly by Richard E. Grant. Together the yin and yang pair scheme to not only cheat people out of money but to also enjoy life a bit. They are a fascinating dichotomy; he’s outgoing, she’s a loner—each pulling each other toward their desired comfort zone. In today’s movie and TV world of male anti-heroes, it’s refreshing to see a female in this role. McCarthy said that in portraying Israel, she became very attached to Lee and wanted people to see her for everything Israel was: for her talent, her intelligence, her caustic, remarkable wit and to also see her difficult circumstances, her flaws, her broken heart, her anger. She wants people to love her as much as she does. Unquestionably after viewing the film, one sees the difficulty Lee went through, as well as the extreme measures she used to authenticate the letters. She purchased many vintage typewriters, doctored the paper utilizing crumbling, baking, and staining, practiced signatures, researched the celebrity to find their true voice, and became brazen enough to steal letters from libraries and replaced them with forged copies. Her buyers marveled at the content (this only spurred her on), no more rejection, the buyers were thrilled to see her when she brought a new piece to sell. It all seems harmless, right? The collectors and buyers are happy; Lee can buy medicine for her cat and buy food and pay her bills. Only one big problem, this illegal crime is punishable with serving jail time as the end result. Director Marielle Heller (“The Diary of a Teenage Girl,” (2015) and the upcoming “Untitled Mr. Rogers” film (2019), gives McCarthy space to showcase her emotional pain and frustrations; yet her dry wit shines through with a caustic remark or skewed facial gesture. Heller’s pacing of the scam draws us in, with each affirmation, Lee sets her stakes higher, until she’s stealing actual letters from the Yale University library, replacing them with forgeries and selling the originals. Que, Paul Simon’s haunting, “Can’t Run But” setting an eerie tone. Be sure to catch Ben Falcone, McCarthy’s husband as one of the book dealers, and Jane Curtain as her atrocious literary agent. There’s much to learn from this cautionary character study of Lee Israel, her lonely life was brightened by incredible circumstances, of which she has no regrets. Hard knocks are a part of life, and you never know who just may need a friend, despite glaring polar opposite personas. In the end, viewing both McCarthy and Grant together was a treat, I looked forward to again and again.